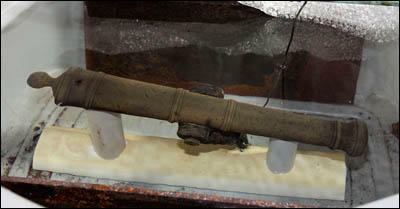 This small cannon from the ship is one of hundreds of items being conserved at ECU's QAR lab. Conservators with the Queen Anne’s Revenge project have utilized new x-ray technology to further efforts to preserve artifacts brought up from the Beaufort Harbor wreck site of the pirate Blackbeard’s flagship. George Olsen has more. An update on efforts to use new 3D imaging technology to aid in preservation of Queen Anne's Revenge artifacts. Literally thousands and thousands of artifacts have been brought up off the ocean floor since the 1996 discovery of the Queen Anne’s Revenge. Some of the items that come up are easily identifiable. Others… not so much. Kimberly Kenyon, a conservator with the Queen Anne’s Revenge conservation lab in Greenville. She was speaking to me back in April of this year in advance of the lab using a new x-ray technology to better understand what was encased inside those “amorphous blobs.” The lab has used conventional 2D x-ray technology to try and decipher what exactly is inside a concreted artifact. Over the summer they planned to try out 3D x-ray technology being used at Davidson College. They completed their scans last month with positive results. The 3D couldn’t quite provide enough detail to indicate when the coin was struck but provided enough detail to indicate it’s similar to a coin that was earlier recovered from the wreck site and now on display at the Beaufort Maritime Museum. So what you’ve got is 3D showing what was thought to be a coin was actually a coin. On the surface … so what? But for a conservationist, getting that detail… indicating that what you have is likely a silver coin similar to one previously recovered, indicates how to proceed. The 3D also provided some proof that even pirates have to do a little “field engineering” to keep a ship running. Kimberly Kenyon called the 3D imaging software an “incredible tool” for their conservation process. Still, there were some disappointments. Kenyon says they were able to get images on about ten items. However, some especially weighty concretions were immune, so to speak, from the 3D x-ray process. But now they know, meaning future 3D look-sees at artifacts coming off the Beaufort Harbour floor might reveal more detailed secrets sooner rather than later. Kimberly Kenyon is a conservator with the Queen Anne’s Revenge conservation lab in Greenville. I’m George Olsen.